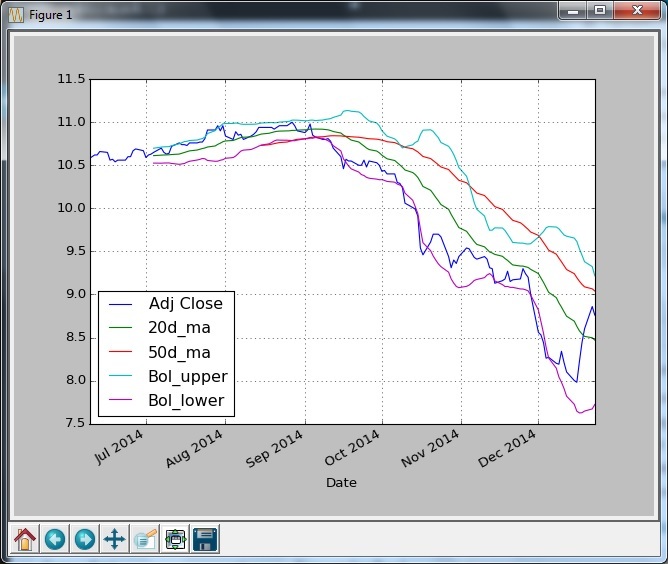 Simple technical analysis for stocks can be performed using the python pandas module with graphical display. Example of basic analysis including simple moving averages, Moving Average Convergence Divergence (MACD) and Bollinger bands and width. For the tech analysis to be performed, daily prices need to be collected for each stock. The Yahoo Finance API can retrieve the required data. The previous post described the method to link the YF API to python. After the historical prices are retrieved, the method for getting the various technical analysis can be easily done using the Pandas rolling mean method and plots can be done using Pandas plot function and additional help from Matplotlib. Below is snippet of the script that initialize the hist data pulling and display the Bollinger Bands and Bollinger Width for a particular stock (Keppel Corp: BN4.SI).